The shirt probably could use a good washing -- but that might be the end of it. After 1955 the next two seasons weren't nearly so sensational. In '56 they won a thrilling National League race at the very end, but lost to the Yankees in the World Series. I saw the last inning or so of Don Larsen's perfect game on television, after rushing home from school -- it was baseball history at its most inner, "forever" essence. In 1957 my Father and I determined that I (then "we," then "he") would keep a scrapbook of all box scores in anticipation of documenting another pennant. 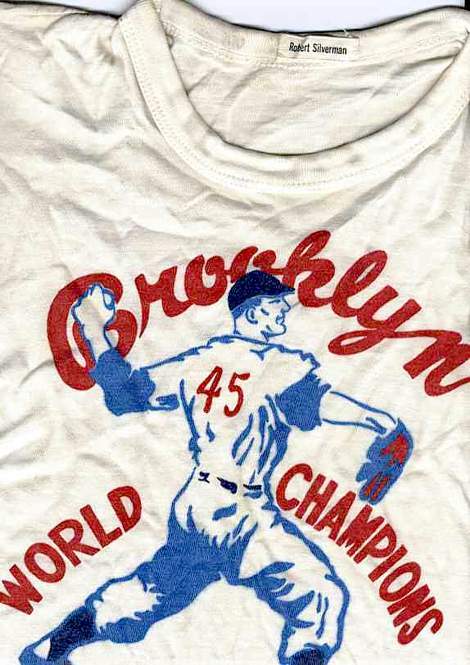 We did, but the Dodgers finished a distant third that year -- they were never close. And toward the end of the season they announced to their mostly disbelieving fans that the team would move to Los Angeles. It was a bit, or more than a bit, devastating, but perhaps something about endurance was gained in the experience. I still have that season's box score scrapbook, pages marked by the passage of time. For the last major league baseball game ever played at Ebbets Field we also saved the fairly short article, black-bordered as it was, bittersweet in tone, with its two photos. The game itself was meaningless to the season, but the event still echoes somewhere deeply but perhaps increasingly dimly within me.